2Université Paris-Est, Laboratoire Navier, UMR 8205 CNRS, ENPC ParisTech, IFSTTAR, France. Isolating small volumes of gas or liquid in the form of bubbles or droplets is important for a wide range of applications (pharmaceutics, cosmetics…), and they are major elements in the production of emulsions, foams, sprays, etc. Advanced applications require such fluid objects having specific features such as high mobility on solid substrates and significant robustness. The mechanical properties of individual bubbles/drops strongly impact the behavior of the material they are part of. Controlling the properties of bubbles/drops and developing methods to tune them is therefore important. Surfactants and macromolecules (such as proteins) -- adsorbed at fluid interfaces -- lower intern overpressure (also called Laplace pressure ΔPcap) of bubbles and drops by lowering surface tension. Solid particles can be advantageously used to confer unequaled properties to the resulting "armored" bubbles and drops. Droplets coated by solid particles, known as liquid marbles, exhibit unusual features; they are highly mobile  and their drying rate can be significantly decreased . The dissolution of "armored" bubbles can be stopped as well . Moreover, droplets and bubbles can be stable in a non-spherical shape when covered by particles . Solid particles adsorbed at the interface can also mechanically strengthen bubbles and drops, so the later can sustain slightly negative pressures, i.e. 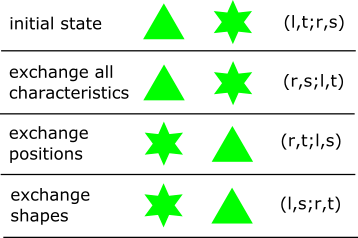 ΔP ∼ ΔPcap, before collapsing [3,5,6,7]. Note that in these systems, particles are bounded to by a unique fluid-fluid interface. In our recent article , we have shown that the same concept can be applied to air bubbles within an air environment. These particulate bubbles, that we call gas marbles, are delimited by a monolayer of solid particles confined in a thin liquid film, i.e. bounded by two interfaces. Collapse pressures we measured are ∼10 times greater than the one reported for liquid marbles, i.e. ΔP ∼ 10 ΔPcap. Moreover, gas marbles can sustain a significant overpressure before inflating. We attribute these remarkable results to the cohesion between the grains that form the shell delimiting gas marbles. Indeed, observation of the shell revealed that the liquid distributes in the pores between the particles (see Fig 1). This capillary structure is likely to induce attractive interactions between the particles. Thus, the remarkable strength of gas marbles results from the cohesion in the particulate shell. Gas marbles can be generated by immersing and withdrawing a rectangular frame into a surfactant solution with a particle raft laying on its interface. The particulate interface initially -- lifted by the frame -- eventually detaches due to its weight and closes over itself creating a gas marble. This technique is similar to how soap bubbles are created; in our case gravity replaces blowing onto the film to deform it. The liquid used to create gas marbles is an aqueous solution of Sodium Dodecyl Sulfate (SDS) with a surface tension equal to 36 mN/m. The particles are monosized polystyrene beads. Three different particle diameters were used: 250, 315 and 590 µm. To modify their wetting properties, the particles have been immersed into a mixture made up of octane solution and dissolved silane. After the silanization, the advancing contact angle between the particles and the SDS solution is equal to 95 ± 10o making them slightly hydrophobic. Pictures and schemes showing the structure of gas marbles are presented in Fig 1. The diameter of gas marbles we study ranges between 5 to 12 mm. We have characterized the properties of gas marbles by studying their behavior when submitted to pressure variations. In practice, we connect a gas marble to a syringe and a pressure sensor, by changing the volume of the syringe using a syringe pump, we induce either inflation or deflation of the gas marble under study. Increasing the syringe volume results in a decrease of the gas marble inner pressure, and vice versa. Thanks to two cameras placed above and below, we were able to follow the shape of gas marbles during experiments. We have observed the same qualitative behavior during all experiments. First, the inner relative pressure of gas marbles is equal to zero at equilibrium (no pressure variation imposed). This result shows that -- contrary to soap bubbles -- Laplace’s law does not apply to gas marbles. Such effect results from the surface stress supported by the force network arising from contacts between particles trapped in the monolayer discussed above [9,10,11]. Second, during both inflation and deflation experiments, gas marbles go through a first regime where they do not deform despite the imposed overpressure/under-pressure. Eventually gas marbles deform at a critical relative pressure. A fracture consisting in the stretching of the liquid connecting the particles is observed at the critical overpressure while gas marbles collapse at the critical under-pressure. Critical relative pressures we measured do not seem to depend on the diameter of gas marbles and the size of the particles composing the shell within the size range we explored. Moreover, critical relative pressures have the same amplitude (∼ 500 Pa) for inflation and deflation experiments. As said before, we attribute these exceptional properties to the particle confinement imposed by the double interface delimiting gas marbles, whereas a single interface is present for armored bubbles and drops. Concerning applications, gas marbles could be used to improve the stability of particle laden foams and emulsions. They could also be used to store and transport small volumes of gas. Pascale Aussillous, David Quéré, "Liquid marbles". Nature, 411, 924 (2001). Abstract. Benoît Laborie, Florent Lachaussée, Elise Lorenceaua, Florence Rouyer, "How coatings with hydrophobic particles may change the drying of water droplets: incompressible surface versus porous media effects". Soft Matter, 9, 4822 (2013). Abstract. Manouk Abkarian, Anand Bala Subramaniam, Shin-Hyun Kim, Ryan J. Larsen, Seung-Man Yang, Howard A. Stone, "Dissolution arrest and stability of particle-covered bubbles". Physical Review Letters, 99, 188301 (2007). Abstract. Anand Bala Subramaniam, Manouk Abkarian, L. Mahadevan, Howard A. Stone, "Colloid science : Non-spherical bubbles". Nature, 438, 930 (2005). Abstract. O. Pitois, M. Buisson, X. Chateau, "On the collapse pressure of armored bubbles and drops". The European Physical Journal E, 38, 48 (2015). Abstract. 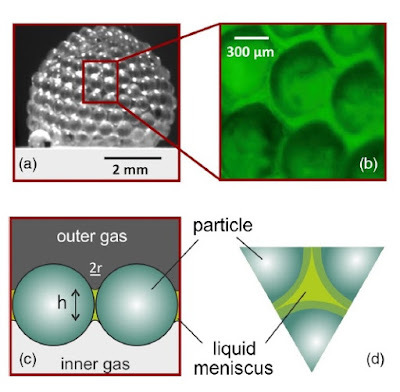 Nicolas Taccoen, François Lequeux, Deniz Z. Gunes, Charles N. Baroud, "Probing the mechanical strength of an armored bubble and its implication to particle-stabilized foams". Physical Review X, 6, 011010 (2016). Abstract. Cécile Monteux, John Kirkwood, Hui Xu, Eric Jung, Gerald G. Fuller, "Determining the mechanical response of particle-laden fluid interfaces using surface pressure isotherms and bulk pressure measurements of droplets". Physical Chemistry Chemical Physics, 9(48), 6344-6350 (2007). Abstract. Yousra Timounay, Olivier Pitois, Florence Rouyer, "Gas Marbles: Much Stronger than Liquid Marbles". Physical Review Letters, 118, 228001 (2017). Abstract. Antonio Stocco, Wiebke Drenckhan, Emanuelle Rio, Dominique Langevina, Bernard P. Binks, "Particle-stabilised foams: an interfacial study". Soft Matter, 5, 2215 (2009). Abstract. Valeria Garbin, John C. Crocker, Kathleen J. Stebe, "Nanoparticles at fluid interfaces: Exploiting capping ligands to control adsorption, stability and dynamics". Journal of colloid and interface science, 387, 1 (2012). Abstract. Guillaume Lagubeau, Antonella Rescaglio, Francisco Melo, "Armoring a droplet: Soft jamming of a dense granular interface". Physical Review E, 90, 030201 (2014). Abstract. Clarendon Laboratory, Department of Physics, University of Oxford, UK. *Current address: Institute for Functional Matter and Quantum Technologies and Center for Integrated Quantum Science and Technology IQST, University of Stuttgart, Germany. The exchange symmetry of identical particles is a foundational principle in quantum physics. If two particles are identical, then the outcomes of any measurements of the system should be unaffected if the particles are swapped. A theory of such particles should therefore give the same predictions if all of the degrees of freedom of the two particles are exchanged. Indeed, this exchange symmetry provides a useful classification for quantum particles: Bosons are described by many-particle wavefunctions that are symmetric under such exchange, whereas fermions have anti-symmetric wavefunctions. A simple example of invariance under exchange is illustrated in figure 1. Two particles are characterized by their position (p) and shape (s). We can label their joint state as (p, s; p', s'), as shown in Fig. 1a. If the particles are exchanged, then the new joint state is (p', s'; p, s), as in Fig. 1b. It is obvious that there is no difference between these two states. What happens, though, if we were to exchange only some of the labels? Say, the positions of the particles, but not their shapes. In that case the state would be (p, s'; p', s), as in Fig.1c. It’s clear that this partially-exchanged state is different than the original state. Now, let’s imagine the case when the two particles have the same shape, so s=s'. In that case we might say that the particles were indistinguishable, since exchanging the other degree of freedom would leave the state unchanged. Fig 1. Full and partial exchange of the degrees of freedom of two particles. 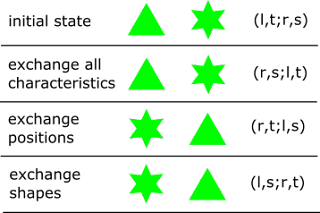 The single-particle states are denoted by position, left (l) or right (r), and shape, triangle (t) or star (s). In fact, most particles have more complicated specifications of their states, and this allows a third option: partially distinguishable particles. For instance, imagine two photons in non-overlapping positions (left and right) with identical colour, or spectra: they are both red, say. These photons are would be indistinguishable, since exchange of their positions results in no change to the two-photon state. In contrast, let’s say the photons have non-overlapping spectra: the photon on the left is blue, while the other is red. If we now exchange their positions, we obtain a state that has no overlap with the initial configuration. Therefore, a measurement can completely distinguish whether or not the exchange occurred. The two photons are said to be distinguishable with respect to exchange of position. If two photons had partly overlapping spectra, they would be partially distinguishable. In this case, the nature of the particles can be roughly understood as an interpolation of completely indistinguishable and distinguishable cases, governed by the degree of their spectral overlap. Remarkably, however, this perspective does not work for more than two particles. In this case the fact that we are dealing with wavefunctions characterized by complex probability amplitudes is critical. In our recent study of the properties of particle exchange among several photons, we have discovered some intriguing new features, which indicate how three particles are very different from two particles and why more particles can be decomposed into properties of three photons – or triads, as we’ll call them. interpolation of completely indistinguishable and distinguishable cases, governed by the degree of their spectral overlap. How do we investigate the nature of distinguishability for several particles? It turns out light provides an excellent opportunity to do so. Photons are massless bosons with no charge. They do not interact easily, and effectively cannot do so at all in free space. Thus it is only their bosonic character that links the evolution of multi-particle states. Further, photons can be engineered to have a wide variety of wavefunctions, specified by their external degrees of freedom that result in properties such as time, spectrum, space, direction and polarization. This makes it possible to make them distinguishable, indistinguishable or partly distinguishable. Moreover, they can be generated, manipulated and detected in ambient conditions, revealing quantum phenomena without complicated apparatus. What we have done is build photon networks that allow the particles to co-propagate through a series of beam splitters. Because these networks consist entirely of linear optical elements the only means by which the photons can react is through their intrinsic “boson-ness”. When two similar photons enter the two input ports of a beam splitter, for instance, they tend to “bunch” together, leaving through the same output port. This is the well-known Hong-Ou-Mandel effect, first demonstrated in 1987. It turns out that this effect is in fact a direct measurement of the symmetry of the wavefunction under exchange of the particles’ positions. The reason for this is straightforward to see, and is illustrated in the first movies, Video 1a and 1b. One may consider the beam splitter as a 2X2 network: there are two input beams and two output. Either photon could pass directly through the network: input 1 to output 1, say. Or the two could exchange: input 1 to output 2. These two options offer two paths for one photon to emerge in each output port. The degree to which the quantum amplitudes for these paths interfere is governed by the distinguishability of the “unexchanged” and “exchanged” states. (Caption for videos above) Beam splitter: In the case of a beam-splitter there are two possible paths the photons can take, when considering coincident detection of one photon in each output mode of the interferometer: One where both photons remain in the waveguide they started in, or where they exchange positions. Interference from paths where two photons are exchanged leads to non-classical Hong-Ou-Mandel interference. There is a further reason why this is important. Optical quantum information processing schemes rely on the interference of multiple photons for their enhanced performance. A key goal is to demonstrate a quantum machine that can outperform a conventional computer at a well-posed computational task, and thus show quantum “supremacy” or quantum advantage. 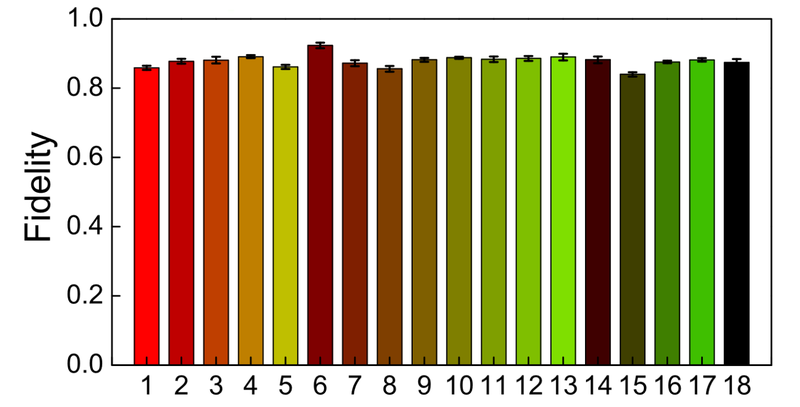 A promising computing problem for this challenge is called BosonSampling. It addresses the following question: given N non-interacting bosons at the input of an M-port random network (where M > N2), what is the distribution of the bosons measured at the output ports? It turns out that the probability of each possible measurement outcome is related to the permanent of the complex-valued transfer matrix that describes the relevant network section. 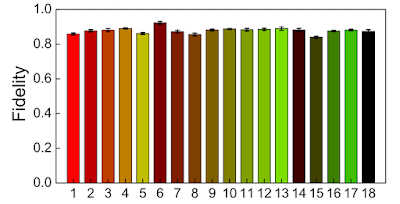 Furthermore, estimating such matrix permanents is known to be a hard computational problem for classical computers. However, since photons are boson and multiport optical networks can be composed from simple linear optical elements, it seems that constructing a quantum machine that naturally tackles BosonSampling might be feasible. Remarkably, such a machine would accomplish a task known to be unreachable by classical algorithms. One of the challenges in building these kinds of quantum information processing technologies is to ensure that all the photons are identical. The details of how distinguishable photons interfere is known in complete detail only for one and two photons. In our work we extended such studies to three photons. That may seem a small step, but it reveals a complex landscape, not all the features of which were known. For example, we identified a new phase – the triad phase – that is not present in two-photon interference, and which appears to be a qualitatively new element that characterizes all higher order states. We measured the probability that three photons put into the three ports of a “tritter”, labelled, say, 1, 2, and 3, would end up at the three output ports. A tritter is a device that couples each input port symmetrically to each output port. In our experiment we used on constructed out of optical fibers, in which all three modes are connected by allowing the evanescent fields of the guided modes to overlap, thereby coupling all the modes to each other with equal strength. This enables the input photons to scatter into all the output modes. The probability that there is a photon in each of the output ports can now happen in six ways, as shown in the second set of videos, 2a and 2b. First, none of the photons are scattered out of their input mode and end up at the same mode at the output, represented as 123 -> 123. Second, pairs of photons exchange modes, and one photon remains in its original mode, so 123 - > 213, for example. There are three such terms. Third, pairs of photons exchange twice. There are two such terms: 123 - > 213 -> 231; 123 - > 132 ->312. These pathways represent possible actual events and therefore the probability of their occurence must be determined by adding together their amplitudes coherently, taking the modulus squared of this quantity and tracing over the unmeasured degrees of freedom. The resulting number is a direct measure of the difference between the input three-photon wavefunction and its exchanged versions. The more distinguishable the photons become, the larger this distance and the disappearance of any interference pattern. (Caption for videos above) Tritter: Here we illustrate two possible scenarios how three photons can traverse a tritter. In the first case, they remain in the waveguide they started in, while in the second scenario each photon couples into a different waveguide, leading to a full exchange of all three photons. The triad phase arises precisely from interference between paths, where a full three-photon exchange occurs. We could also imagine paths where only two photons exchange position, while the third one does not participate. Contributions from these paths lead to Hong-Ou-Mandel like “two-photon” interference. Isolating “genuine” three photon interference from two-photon interference is one of the hallmarks of our paper. In our experiment the photons can be made distinguishable by adjusting the delays between them. 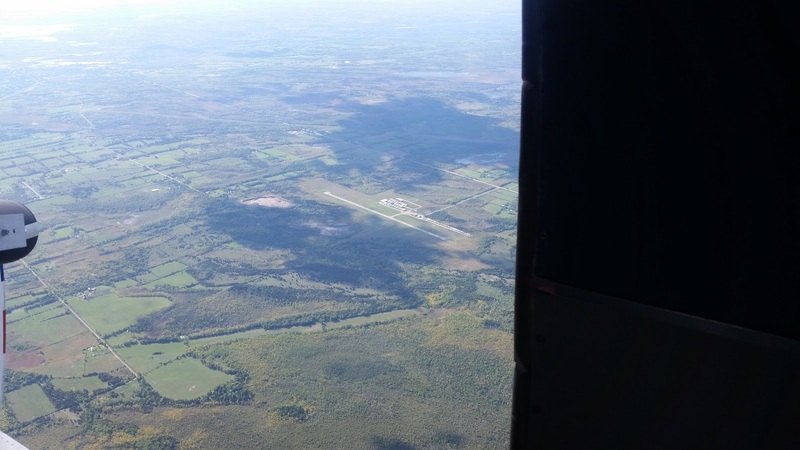 But delays alone are insufficient to explore the entire state space. That’s because a there are three complex numbers specifying the three state overlaps and delays provide only two parameters. Therefore we used an additional degree of freedom – the polarization of each of the photons to provide a means to access the necessary parameters. By setting all three polarizations to be the same, the triad phase is zero (as long as some simple conditions on the photon spectra are satisfied). In this case, the three-photon exchange term dominates, yielding a coincidence rate that is larger than when the photons are completely distinguishable. As the photons are made more distinguishable, the pair-wise exchange terms dominate, leading to a reduction in the coincidences below that of fully distinguishable photons, reminiscent of the Hong-Ou-Mandel dip. But they never completely dominate, so that there is never a complete suppression of coincidences. The triad phase can be set to a non-zero value by adjusting the relative polarizations of the three input photons. For example, when they are polarized at 120 degrees to each other, the triad phase is π. In this case, the three-photon exchange and the two-photon exchange contributions are of the same sign, and both contribute to a dip. The photons are of course in this case rather distinguishable, so in some ways it is surprising to see such a suppression of coincidences arising from interference. It is possible to adjust the polarizations as the photons are rendered more distinguishable by delaying them in such a way as to keep all of the two-photon coincidences constant. This is analogous to the one-photon rates in the Hong-Ou-Mandel experiment, which should be constant in order that the two-photon dip can be proven to be non-classical in origin. We find in our experiment that the three-photon coincidence exhibits an analogous dip, which is the first time that the fully exchanged three-photon wavefunction has been isolated by interference. Are there more complex structures for more than three photons? Of course the interference patterns are richer, and we can expect that new features appear. But it might be that there are no new classes of parameters that are needed. In other words, by measuring the triad phase of all photon triplets entering the device one can determine whether the photons are identical. If so, then pair-wise two-photon correlations would be insufficient to fully characterize a linear optical interferometer, and three-photon correlations both necessary and sufficient. The nature of multi-particle wavefunctions, and in particular the degree to which partially distinguishable particles can still exhibit non-classical phenomena (not to say provide quantum enhancement in technological applications) is an area ripe for exploration. New features arise when one goes from one to two particles, and the richness of three particles is startling. What new ones will be found in the wavefunctions of higher particle numbers remains to be seen. Adrian J. Menssen, Alex E. Jones, Benjamin J. Metcalf, Malte C. Tichy, Stefanie Barz, W. Steven Kolthammer, Ian A. Walmsley, "Distinguishability and many-particle interference". Physical Review Letters, 118, 153603 (2017). Abstract. arXiv:1609.09804. Our current understanding of fundamental physics is based on four interactions: electromagnetism, the weak interaction, the strong interaction and gravitation. The first three ones are unified in a common framework, the Standard Model of particle physics based on a relativistic quantum field theory. On the other hand, Einstein’s theory of General Relativity, the gravitational theory, has not been successfully included in this quantum framework so far. The development of a quantum theory of gravity is important to understand phenomena that take place in very strong gravitational fields like for example in our very early universe or around black holes. In addition, Dark Matter and Dark Energy are contributing to 26% and 69% to the mass-energy content of our Universe . These two components of our Universe, essential to explain some cosmological and astrophysical observations, have not been directly observed so far and are also challenging General Relativity (see e.g. ). For these reasons, in the last decades, theoreticians have developed many modified gravitational theories (see  and references therein). On the other hand, there has been a tremendous effort to confront General Relativity with different observations and to search for a deviation from General Relativity using a large number of experiments (see the review ). Historically, tests of gravitation have been first performed in the Solar System and in laboratories on Earth where extremely good accuracy in the measurements can be achieved. In these low gravitational fields, the agreement between General Relativity’s predictions and observations is extremely good. It is therefore highly interesting to perform such tests in other environments, such as in strong gravitational fields. the motion of the planets around our Sun). These observations have led to many great discoveries, the most important one being the evidence for a supermassive black hole at the center of our Galaxy . Two types of observations are made at the Keck observatory: (i) astrometric observations which give the 2-dimensional position of the stars in the plane of the sky and (ii) spectroscopic measurements which give the radial velocity of the stars. Nowadays, the typical accuracy of these measurements is at the level of 0.2 milliarcsecond for astrometry and of 30 km/s for radial velocity for a bright star. 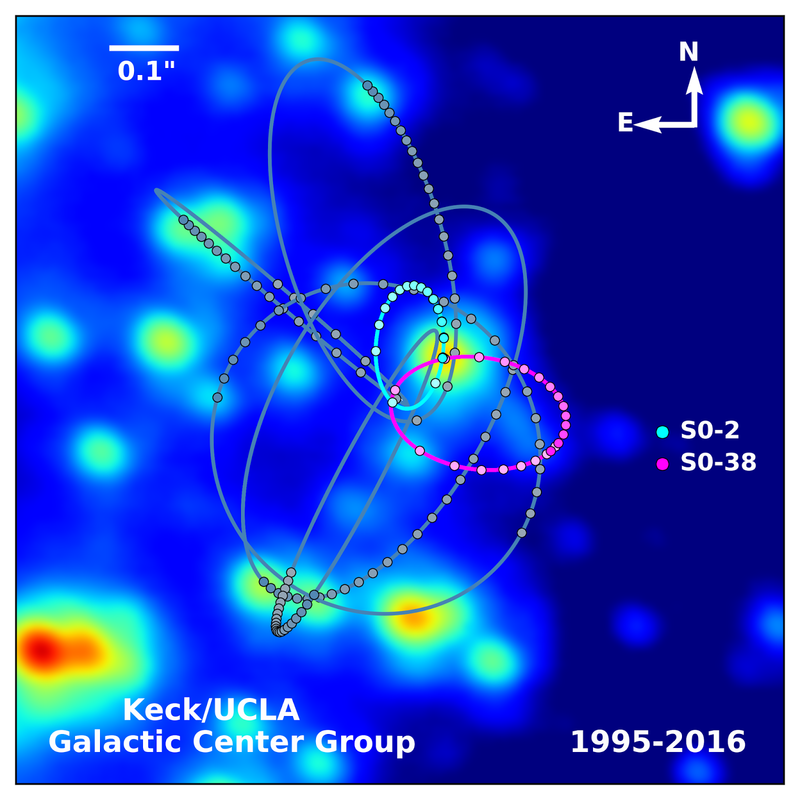 Recently, observations of two of these stars, S0-2 (period: 16 years) and S0-38 (period: 19 years), have been used to measure our distance to the Galactic Center and the mass of the central supermassive black hole with an accuracy of 5%  (Fig. 1 shows the orbit of these two stars). Fig 1 : Orbital motion of two stars, S0-2 and S0-38, orbiting around the supermassive black hole at the center of our Galaxy. Observations of these two stars have been used to test the gravitational theory and to constrain the presence of a hypothetical 5th force. Credit: S. Sakai and A. Ghez, W. M. Keck Observatory/UCLA Galactic Center Group. In a recent work , we used these observations to perform a test of the gravitational theory using orbital dynamics in a strong gravitational field generated by a supermassive black hole. The main novelty in using these measurements to test General Relativity comes from the fact that we are probing the gravitational theory in a gravitational field much stronger than for example in the Solar System, around a central mass which is much more massive (the black hole mass is 4 x 106 the mass of the Sun) and around an extremely interesting body: a black hole. More precisely, short-period stars are constraining the presence of a hypothetical fifth force in our Galactic Center. A fifth interaction is predicted by many modifications of General Relativity developed in order to unify it with the Standard Model of particle physics and by models of Dark Matter and Dark Energy. This fifth force is parametrized by a length of interaction λ and a strength of interaction α, both of these parameters being constrained observationally by Solar System observations and by laboratory measurements (see e.g. ). We used observations of S0-2 and S0-38 to search for a fifth force in a strong gravitational field generated by a black hole . No deviation from General Relativity has been observed and new constraint on this scenario has been derived (see Fig. 2). Two main factors are expected to improve such an analysis in the future. First, in 2018, the star S0-2 will experience its closest approach to the supermassive black hole. At that time, the gravitational effects experienced by the star are the strongest and the possibility to measure relativistic effects and to test General Relativity is enhanced. Observations during S0-2’s closest approach in 2018 will be the most sensitive to a hypothetical deviation from General Relativity. The UCLA Galactic Center Group is currently actively preparing this wonderful event. On the other hand, the development of the next generation of extremely large telescope, such as the Thirty Meter Telescope, will allow us to detect and to track stars that are even closer to the black hole. On the long-term, this will improve significantly tests of General Relativity. Fig 2: (click on the image to view with higher resolution) Constraints on a hypothetical fifth interaction. In green are constraints coming from Earth observations or from the LAGEOS satellites, in blue the constraints coming from Lunar Laser Ranging observations, in orange constraints from planetary ephemerides and in red the new constraint obtained using observations of stars around our Galactic Center. Our current analysis probed the 5th interaction in a strong gravity field as emphasized in the right panel (red region). Planck Collaboration, “Planck 2015 results. XIII. Cosmological parameters”. Astronomy & Astrophysics, 594, A13 (2016). Abstract. Ivan Debono, George F. Smoot, “General Relativity and Cosmology: Unsolved Questions and Future Directions”. Universe, 2, 23 (2016). Abstract. Timothy Clifton, Pedro G. Ferreira, Antonio Padilla, Constantinos Skordis, “Modified gravity and cosmology”. Physics Reports, 513, 1 (2012). Abstract. Clifford M. Will, “The Confrontation between General Relativity and Experiment”. Living Review in Relativity, 17, 4 (2014). Abstract. Sagittarius A*: Evidence for a Supermassive Black Hole at the Center of Our Galaxy”. Astrophysical Journal, 509, 678 (1998). Abstract. A. Boehle, A. M. Ghez, R. Schödel, L. Meyer, S. Yelda, S. Albers, G. D. Martinez, E. E. Becklin, T. Do, J. R. Lu, K. Matthews, M. R. Morris, B. Sitarski, G. Witzel, “An Improved Distance and Mass Estimate for Sgr A* from a Multistar Orbit Analysis”. Astrophysical Journal, 830, 17 (2016). Abstract. A. Hees, T. Do, A. M. Ghez, G. D. Martinez, S. Naoz, E. E. Becklin, A. Boehle, S. Chappell, D. Chu, A. Dehghanfar, K. Kosmo, J. R. Lu, K. Matthews, M. R. Morris, S. Sakai, R. Schödel, G. Witzel, “Testing General Relativity with stellar orbits around the supermassive black hole in our Galactic center”. Physical. Review Letters, 118, 211101 (2017). Abstract. E.G. Adelberger, J.H. Gundlach, B.R. Heckel, S. Hoedl, S. Schlamminger, “Torsion balance experiments: A low-energy frontier of particle physics”. Progress in Particle and Nuclear Physics 62, 102 (2009). Abstract. Research in electronic devices is pushing the size of transistors below the 10 nm mark, but at this scale information processing faces difficulties in terms of heat dissipation, as well as in controlling quantum effects such as electron tunneling. An alternative to electron-based computing lies in the creation of all-optical computational devices. Although we are still far from producing functional processors, today we show how plasmonic structures are viable tools not only for the nanoscale localization of electromagnetic energy but also its transfer, contrary to what their typically high dissipation rates would have us believe. Plasmonics, in general terms, is the field of Physics that studies the interaction of light with materials, mostly at the nanoscale, that support collective electronic oscillations . These plasmonic materials are typically metallic nanoparticles (NPs) or heavily doped semiconductors that exhibit free-electron behavior. When light, as an electromagnetic wave, is incident on the NPs, the free electron gas of the NPs is excited and oscillates as a result of the polarization of the electromagnetic wave. These excited plasmonic oscillations typically have resonances in the visible spectral range and the resonance frequencies depend on the type, shape and size of the plasmon-supporting material. Plasmonic materials afford us the capability of manipulating light and funneling its energy at the nanoscale, and has enabled the creation of novel devices, from optical metamaterials  to efficient nanoscale heat generators . For all-optical computational devices, it is challenging to transfer and manipulate photonic energy at the nanoscale. Here, photon transfer is not feasible using traditional waveguides such as glass fibers, which require sizes comparable to the wavelength of the confined light. Plasmonic nanostructures are remarkably effective in localizing the electromagnetic energy of light, but these structures suffer from high energy losses due to the high rate of electron scattering with the background charges in the material. In our recent work  we show how this essential limitation can be successfully circumvented by carefully considering the interaction of different material systems with distinct plasmonic resonances. By carefully arranging two gold NPs (AuNPs) and a silver NP (AgNP) in a linear chain , our model system takes advantage of the different optical spectra of gold and silver . 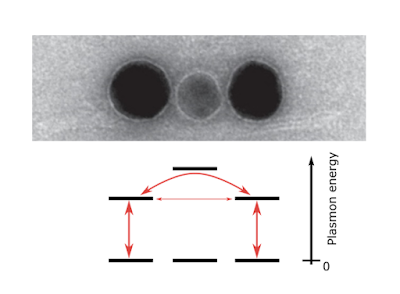 Figure 1 shows a transmission electron microscopy (TEM) image of one of the experimentally fabricated trimers, illustrating the arrangement of our proposed hybrid nanostructure. The two 40 nm AuNPs are spatially separated by a 38 nm gap, partially occupied by a 30 nm AgNP that leaves two 4 nm interparticle gaps. To achieve this accurate NP arrangement we have used the DNA origami technique [5,6] to build a rigid bundle of 14 interconnected, parallel DNA double helices. At three points along this DNA structure, attachment sites for each particle are built, consisting of single-stranded DNA (ssDNA) extensions with orthogonal sequences for each material. Figure 1 also includes a schematic energy diagram of the trimer, which illustrates the main effect explored in the paper. 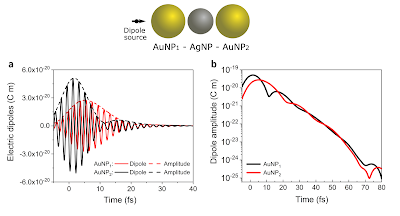 The two AuNP plasmon states are only weakly coupled due to the distance separating them, but the connecting AgNP acts as a bridge for their interaction. More importantly, it mediates the transfer with a plasmonic resonance of different energy than the resonance of the AuNPs. In this way, the AgNP plasmon state is not fully occupied and it functions as a virtual state for the plasmon to travel from one AuNP to the other. 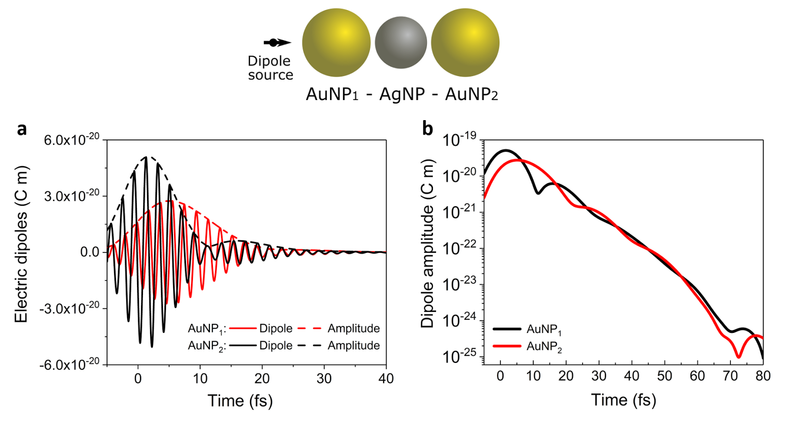 The presence of the AgNP is crucial for the coherent transfer of energy from one AuNP (transmitter) to another (receiver) with negligible energy dissipation. The AgNP bridges the large gap between the AuNPs with a virtual energy state that allows the transfer to take place. As we confirmed experimentally, the distance between the AuNPs is enough to impede their coupling in the absence of the mediating particle. In fact, the AuNPs would respond mostly as independent dipoles in the absence of the AgNP. With the three particles in place, the longitudinal plasmonic resonance of the trimer is far from the resonant frequency of the AgNP. Therefore, this mediating particle facilitates the coupling of the two AuNPs and the excitation of the global trimer plasmon mode, while avoiding the dissipation of heat that would appear in the AgNP resonant excitation. Importantly, our simulations show the hot spots that typically occur between the surfaces of metal particles in close proximity, allowing here the effective coupling of their near fields. The coupling is experimentally verified through the observation of the scattering spectra of the trimer, evidencing the hybridization of the plasmonic modes of the NPs. Figure 2 showcases some of the scattering experimental data, alongside results from the simulated system. In a second set of classical electrodynamic simulations, we observed the time resolved transfer inside the trimer after being excited by a single point dipole source, located just outside the chain. We find an extremely fast plasmon passage between the two outer particles, orders of magnitudes faster than the energy transfer observed in typical Förster-type dipole-dipole interactions . By our calculations, we estimate a transfer time of about 5 fs and the oscillation of energy between the two gold particles for more than 40 fs (Figure 3). We have also described the system with a theoretical quantum model in which the three NPs are considered as three quantum oscillators that are coupled to each other via Coulomb interactions. This quantum model predicts the energy shift of the system’s bright plasmon modes that are observed experimentally, as well as the dark modes found in a full electrodynamical simulation. In summary, in this research we presented a novel approach toward fast and almost loss-less plasmon transfer between metal nanoparticles, which can have a great impact in applications for energy and information transfer on the nanoscale. We used a simple combination of gold and silver nanoparticles to coherently transfer energy and overcome the large heat dissipation characteristic of plasmonic systems. Our proposed quantum model provides us with a clear understanding of the physics, and our full electrodynamic simulation is in excellent agreement with the experimental measurements performed on this exciting system. This work opens new doors for designing future optical-based computing devices and for the teleportation of data over longer distances at the nanoscale. Stefan A. Maier, "Plasmonics: fundamentals and applications" (Springer, 2007). Kan Yao and Yongmin Liu, “Plasmonic metamaterials”. Nanotechnology Rev.iews 3, 177 (2014). Abstract. 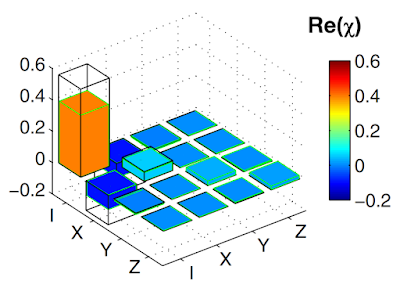 Larousse Khosravi Khorashad, Lucas V. Besteiro, Zhiming Wang, Jason Valentine, and Alexander O. Govorov, “Localization of Excess Temperature Using Plasmonic Hot Spots in Metal Nanostructures: Combining Nano-Optical Antennas with the Fano Effect”. Journal of Physical Chemistry C, 120, 13215 (2016). Abstract. Eva-Maria Roller, Lucas V. Besteiro, Claudia Pupp, Larousse Khosravi Khorashad, Alexander O. Govorov and Tim Liedl, “Hotspot-mediated non-dissipative and ultrafast plasmon passage”. Nature Physics (published online May 15, 2017). Abstract. 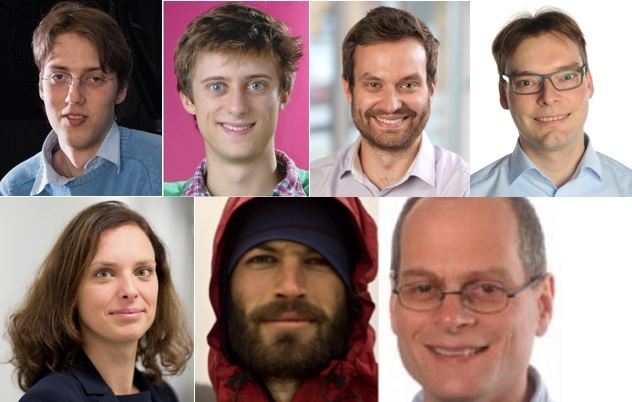 Anton Kuzyk, Robert Schreiber, Zhiyuan Fan, Günther Pardatscher, Eva-Maria Roller, Alexander Högele, Friedrich C. Simmel, Alexander O. Govorov and Tim Liedl, “DNA-based self-assembly of chiral plasmonic nanostructures with tailored optical response". Nature, 483, 311 (2012). Abstract. Paul W. K. Rothemund, “Folding DNA to create nanoscale shapes and patterns”. Nature, 440, 297 (2006). Abstract. Volkhard May and Oliver Kühn, “Charge and Energy Transfer Dynamics in Molecular Systems” (3rd Ed. Wiley, 2011). 3Institute of Physics, Chinese Academy of Sciences, Beijing 100190, China. Quantum solver of linear system is achieved on scalable superconducting quantum computing chip. The most ambitious target of quantum computing is to provide both high-efficiency and useful quantum software for killer applications. After decades of intense research on quantum computing, several quantum algorithms are found to demonstrate speedup over their classical counterparts, such as quantum simulation of molecular or condensed system , Grover search on unstructured database , Shor's period finding to crack RSA cryptography , matrix inversion to solve linear systems  and sampling from a hard distribution [5, 6]. Among them, sampling from a hard distribution is the most radical example to show the pure quantum computing power beyond the reach of any modern conventional computer and achieve "quantum supremacy" in the near-term . However, the high-efficiency quantum supremacy algorithms have not been found to have practical applications yet. And the Grover search and Shor's period finding algorithms are limited to specific applications. On the contrary, the linear equations quantum algorithm can be applied to almost all areas of science and engineering and recently it finds fascinating applications in data science as a basic subroutine, for instance, in quantum data fitting  and quantum support vector machine . 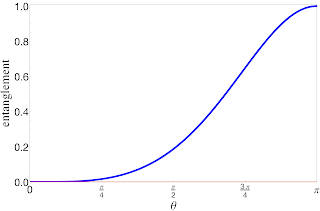 Matrix inversion quantum algorithm to solve linear systems  is proposed by Harrow, Hassidim and Lloyd (HHL) in 2009 to estimate some features of the solution with exponential speedup. The algorithm uses the celebrated quantum phase estimation technology to force the computation to work at the eigen-basis of system matrix and reduce the matrix inversion to simple eigenvalue reciprocal. A compiled version of the HHL algorithm was previously demonstrated with linear optics [10, 11] and liquid NMR  quantum computing platforms, however, both of which are considered not easily scalable to a large number of qubits. Recently, we report the new implementation of the HHL algorithm on solid superconducting quantum circuit system, which is deterministic and easy scalable to large scale. We run a nontrivial instance of smallest 2×2 system on superconducting circuit chip with four X-shape transmon qubits  and tens of one- and two-qubit quantum gates. The chip was fabricated on a sapphire substrate and used aluminum material to define superconducting qubits, resonators and transmission lines. With careful calibration, the single-qubit rotating gates were estimated to be of 98% fidelity and two-qubit entangling gates were of above 95% fidelity. Figure 1 and Figure 2 illustrate the quantum chip and the working quantum circuits, respectively. Fig. 1: False color photomicrograph of the superconducting quantum circuit for solving 2×2 linear equations. 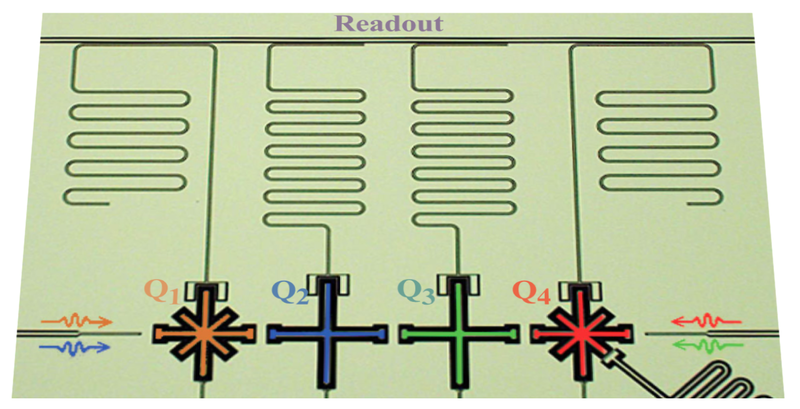 Shown are the four X-shape transmon qubits, marked from Q1 to Q4, and their corresponding readout resonators. Fig. 2: (click on image to view with higher resolution) Compiled quantum circuits for solving 2×2 linear equations with four qubits. There are three subroutines and more than 15 gates as indicated. The quantum solver was tested by 18 different input vectors and the corresponding output solution vectors were characterized using quantum state tomography. In our 2*2 instance, the output qubit was measured along X, Y and Z axes of the Bloch sphere, respectively. The estimated quantum state fidelities ranged from 84.0% to 92.3%. The collected data was further used to infer the quantum process matrix of the solver and yielded the process fidelity of 83.7%. Figure 3 and Figure 4 show the experimental quantum state fidelity distribution and the quantum process matrix, respectively. Fig. 3: Experimental quantum state fidelity distribution of the output states corresponding to the 18 input states. Fig. 4: The real parts of the experimental quantum process matrix (bars with color) and the ideal quantum process matrix (black frames). 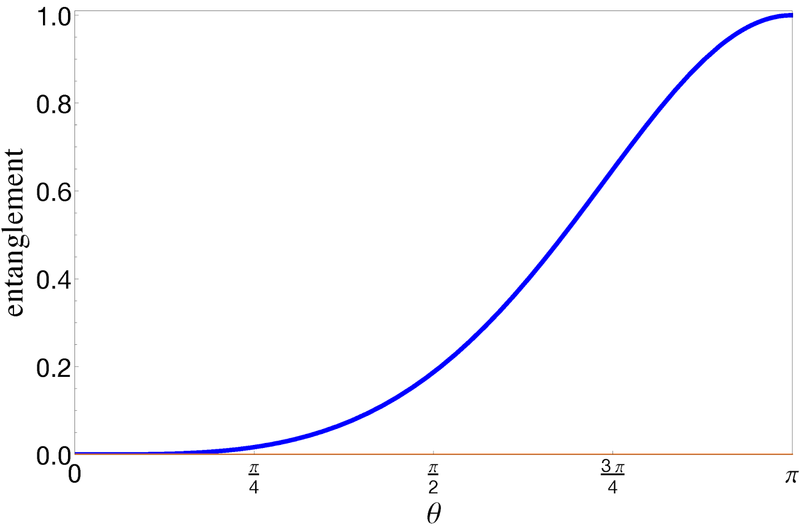 All imaginary components (data not shown) of quantum process are measured to be no higher than 0.015 in magnitude. These experimental results indicate that our superconducting quantum linear solver for 2*2 system have successfully operated. To scale the solver for more complicated instance with high solution accuracy, further improvement of device design and fabrication to increase quantum bit coherent time and optimization of quantum control pulses to reduce the operating time and error rate are necessary. In superconducting quantum circuit platform, there have been vast efforts devoted to scale the circuit complexity and quality, which have extended the qubit coherent time 5~6 orders of magnitude  manipulated up to 10 qubits  in the past decades, and we can expect the continuous progress in next decade to reach a mature level. I. M. Georgescu, S. Ashhab, Franco Nori, "Quantum simulation". Reviews of Modern Physics, 86, 153 (2014). Abstract. Lov K. Grover, "A Fast Quantum Mechanical Algorithm for Database Search", Proceedings of 28th Annual ACM Symposium on Theory of Computing, pp. 212-219 (1996). Abstract. Aram W. Harrow, Avinatan Hassidim, Seth Lloyd, “Quantum algorithm for linear systems of equations”. Physical Review Letters, 103, 150502 (2009). Abstract. A. P. Lund, Michael J. Bremner, T. C. Ralph, "Quantum sampling problems, BosonSampling and quantum supremacy." NPJ Quantum Information, 3:15 (2017). Abstract. Hui Wang, Yu He, Yu-Huai Li, Zu-En Su, Bo Li, He-Liang Huang, Xing Ding, Ming-Cheng Chen, Chang Liu, Jian Qin, Jin-Peng Li, Yu-Ming He, Christian Schneider, Martin Kamp, Cheng-Zhi Peng, Sven Höfling, Chao-Yang Lu, Jian-Wei Pan, "High-efficiency multiphoton boson sampling". Nature Photonics 11, 361 (2017). Abstract. John Preskill, "Quantum computing and the entanglement frontier". arXiv:1203.5813 (2012). Nathan Wiebe, Daniel Braun, Seth Lloyd, "Quantum algorithm for data fitting". Physical review letters 109, 050505 (2012). Abstract. Patrick Rebentrost, Masoud Mohseni, Seth Lloyd, "Quantum support vector machine for big data classification". Physical review letters 113, 130503 (2014). Abstract. X.-D. Cai, C. Weedbrook, Z.-E. Su, M.-C. Chen, Mile Gu, M.-J. Zhu, Li Li, Nai-Le Liu, Chao-Yang Lu, Jian-Wei Pan, "Experimental quantum computing to solve systems of linear equations". Physical review letters 110, 230501 (2013). Abstract. 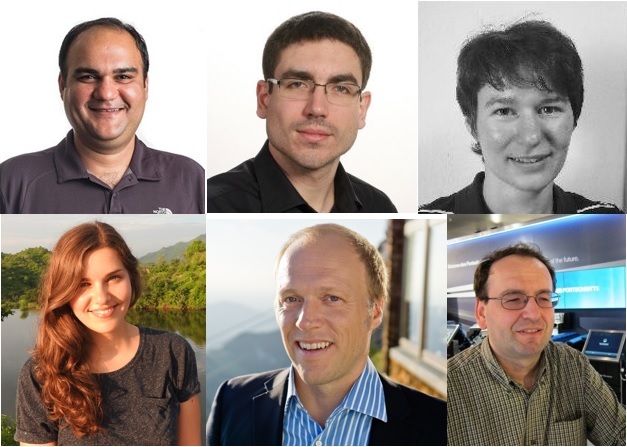 Stefanie Barz, Ivan Kassal, Martin Ringbauer, Yannick Ole Lipp, Borivoje Dakić, Alán Aspuru-Guzik, Philip Walther, "A two-qubit photonic quantum processor and its application to solving systems of linear equations". Scientific reports 4, 6115 (2014). Abstract. Jian Pan, Yudong Cao, Xiwei Yao, Zhaokai Li, Chenyong Ju, Hongwei Chen, Xinhua Peng, Sabre Kais, Jiangfeng Du, "Experimental realization of quantum algorithm for solving linear systems of equations". Physical Review A 89, 022313 (2004). Abstract. Jens Koch, Terri M. Yu, Jay Gambetta, A. 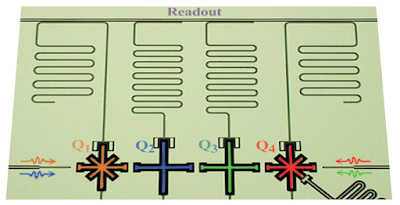 A. Houck, D. I. Schuster, J. Majer, Alexandre Blais, M. H. Devoret, S. M. Girvin, R. J. Schoelkopf, "Charge-insensitive qubit design derived from the Cooper pair box". Physical Review A 76, 042319 (2007). Abstract. 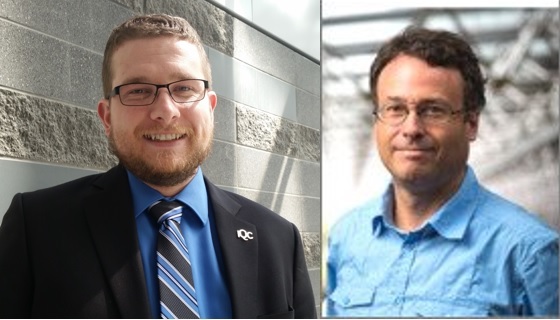 M. H. Devoret, R. J. Schoelkopf1, "Superconducting circuits for quantum information: an outlook". Science, 339, 1169 (2013). Abstract. Chao Song, Kai Xu, Wuxin Liu, Chuiping Yang, Shi-Biao Zheng, Hui Deng, Qiwei Xie, Keqiang Huang, Qiujiang Guo, Libo Zhang, Pengfei Zhang, Da Xu, Dongning Zheng, Xiaobo Zhu, H. Wang, Y.-A. Chen, C.-Y. Lu, Siyuan Han, J.-W. Pan, "10-qubit entanglement and parallel logic operations with a superconducting circuit". arXiv:1703.10302 (2017). 3Dipartimento di Energia, Ingegneria dell'Informazione e Modelli Matematici, Università di Palermo, Italy. The Schmidt decomposition is an important mathematical tool which has been already utilized during the early stages of quantum theory by Schrödinger in the context of quantum measurements [1-3]. This tool allows to determine the set of measurements on one part of the system such that the measurement outcome on the other part is determined, in the sense that to each outcome of the first measurement it corresponds a unique outcome for the second measurement. Schmidt decomposition has been shown to be at the heart of quantum information theory, quantifying entanglement in bipartite systems. It has been also widely employed in the context of Einstein-Podolski-Rosen (EPR) paradox, Bell non-locality and black-hole physics [2-4]. Every element of this decomposition consists unavoidably of two independent subsystems. Application of the Schmidt decomposition to identical particles is therefore hindered by the fact that overlapping particles can never be considered independent. In fact, despite its wide utilization in systems of distinguishable particles, the Schmidt decomposition has remained debated for identical particles [5,6]. For instance, it is well known that for distinguishable particles this tool assesses the entanglement of the system by the von Neumann entropy of the reduced density matrix, whose eigenvalues are the squares of the Schmidt coefficients appearing in the decomposition . Differently, in the case of identical particles, it has been claimed that the relationship between the Schmidt coefficients and the eigenvalues of the reduced density matrix breaks down . In strict connection with this issue, the partial trace operation to get the reduced state has not been considered suitable for quantifying the entanglement of pure states of identical particles [6-8]. We recall that, in Nature, particles are of different types, all particles of each type (electrons, protons, photons and so on) being identical. In the quantum world, the identity of particles gives rise to a new characteristic with respect to the classical world, that is the indistinguishability among particles of the same type [9,10]. This exclusive quantum trait leads to fundamental properties of matter such that particles can be of two classes, named bosons and fermions. Moreover, at variance with the case of distinguishable particles, when identical particles have wave functions that spatially overlap, they can never be taken as independent of each other [11,12]. The latter behavior is an essential requisite in determining features like quantum correlations (e.g., entanglement) among the particles themselves and in the theory of measurement . Nevertheless, identical particles constitute the building blocks of quantum information and computation theory, being present in Bose-Einstein condensates [13,14], quantum dots [15,16], superconducting circuits  and optical setups [18,19]. It is thus important to have trustable methods and tools to characterize the quantum features of composite systems of identical particles under these general conditions. A first step towards this goal has been provided by a recent non-standard approach  which deals with systems of identical particles within a particle-based description (that is, in terms of particle states) without resorting to the usual practice to assign fictitious labels to the particles [9,10], which render the latter distinguishable removing their indistinguishability. In this way, the ambiguity arising from the introduction of these labels in evaluating quantum correlations in identical particle systems is avoided. This method has, in fact, provided a way to calculate partial trace and von Neumann entropy for identical particles. Using this new approach, in a recent work  we have been able to demonstrate that the Schmidt decomposition is universal, meaning that it is also obtainable for an arbitrary state of indistinguishable particles (bosons or fermions) under general conditions of spatial overlap. Thanks to this achievement, the amount of entanglement present in identical particle systems in pure states can be evaluated by the von Neumann entropy of the reduced density matrix, as occurs in the case of distinguishable particles. We have used the Schmidt decomposition to analyze some paradigmatic states of two identical particles to find the suitable measurement basis for unveiling their entanglement properties. These systems are illustrated in Figure 1 and represent simple yet effective examples which make it emerge the effect of particle identity. The first one is the well-known condition of two identical qubits with opposite pseudospins in spatially separated locations, denoted with left (L) and right (R) (see Fig. 1a). Figure 1. (a) Two identical qubits in two spatially separated places with opposite pseudospins. (b) Two identical qubits in the same spatial mode with arbitrary pseudospins. (c) Two identical qutrits (three-level quantum systems) in the same spatial mode. The shaded ellipses indicate that the particles are entangled. Figure from Ref. . Indeed, we have found that the Schmidt decomposition and the corresponding von Neumann entropy supply the results which are physically expected in this situation, such as zero entanglement for a product (separable) state of the two particles and maximal entanglement for a Bell state. We have also explicitly shown that nonlocal measurements induce entanglement in a state of distant identical particles. This means that, in principle, identical particles cannot be considered completely independent even when they are spatially separated. Application of the Schmidt decomposition to a system of two boson qubits in the same site (see Fig. 1b) has evidenced that the entanglement increases as the two internal states tend to be orthogonal, as displayed in the plot of Fig. 2. This finding is a generalization of a previous result obtained only for two identical qubits in the same spatial mode with orthogonal internal states (or pseudospins, that is θ = π in the plot of Fig. 2) . Figure 2. Entanglement between the pseudospins of two identical particles in the same site, quantified by the von Neumann entropy, as a function of the angle θ between the directions of the two pseudospins (internal states). Figure from Ref. .
Two identical (boson) qutrits, that is three-level quantum systems, constitute a system of interest being promising candidates for quantum processors thanks to their good capacity to store quantum information [21,22]. We consider the qutrits in the same site, that is under the condition of complete spatial overlap, as depicted in Fig. 1c. Our method easily determines the two-qutrit entanglement for given combinations of their internal states and provides a physical interpretation. We remark that the entanglement found for the two qutrits is different from that obtained for the same system by an alternative approach, based on a so-called subalgebra technique . The origin of this difference in the entanglement measure requires further investigation, for instance by comparing the two theoretical approaches or by experimental verifications. We now briefly discuss the practical aspect concerning the possibility to exploit the entanglement of identical particles, as identified by the Schmidt decomposition we have introduced. In the context of quantum information processing with distinguishable particles, a well-established resource theory is based on local operations and classical communication (LOCC), where each particle is individually addressed [1-3]. On the other hand, a peculiar trait of indistinguishable particles is that it is not possible to operate on a given individual particle. This characteristic in general hinders the manipulation of composite systems of identical particles for desired tasks of quantum information and computation. Nevertheless, it is known that the entanglement quantified by the von Neumann entropy can be extracted from the state of identical particles and then utilized in a conditional way by LOCC . In conclusion, the universal character of the Schmidt decomposition shown in our work allows a faithful treatment of the entanglement of composite systems of identical particles and opens the way to more general investigations of collective properties of such systems. Ryszard Horodecki, Paweł Horodecki, Michał Horodecki, Karol Horodecki, “Quantum entanglement”, Review of Modern Physics, 81, 865 (2009). Abstract. John Preskill, “Lectures notes for physics 229: Quantum information and computation” (1998) Link. Michael A. Nielsen and Isaac L. Chuang, “Quantum Computation and Quantum Information” (Cambridge University Press, Cambridge, 2000). E.D. Belokolos, M.V. Teslyk, “Scalar field entanglement entropy of a Schwarzschild black hole from the Schmidt decomposition viewpoint”, Classical and Quantum Gravity, 26, 235008 (2009). Abstract. R. Paškauskas, L. You, “Quantum correlations in two-boson wave functions”, Physical Review A, 64, 042310 (2001). Abstract. Malte C Tichy, Florian Mintert, Andreas Buchleitner, “Essential entanglement for atomic and molecular physics”, Journal of Physics B: Atomic, Molecular and Optical Physics. 44, 192001 (2011). Abstract. GianCarlo Ghirardi, Luca Marinatto, Tullio Weber, “Entanglement and properties of composite quantum systems: a conceptual and mathematical analysis”, Journal of Statistical Physics 108, 49 (2002). Abstract. A. Balachandran, T. Govindarajan, Amilcar R. de Queiroz, A. Reyes-Lega, “Entanglement and particle identity: A unifying approach”, Physical Review Letters, 110, 080503 (2013). Abstract. Asher Peres, “Quantum Theory: Concepts and Methods” (Springer, Dordrecht, The Netherlands, 1995). Claude Cohen-Tannoudji, Bernard Diu, Franck Laloe, “Quantum mechanics, Vol. 2” (Wiley-VCH, Paris, France, 2005). John Schliemann, J. Ignacio Cirac, Marek Kuś, Maciej Lewenstein, Daniel Loss, “Quantum correlations in two-fermion systems”, Physical Review A, 64, 022303 (2001). Abstract. Rosario Lo Franco, Giuseppe Compagno, “Quantum entanglement of identical particles by standard information-theoretic notions”, Scientific Reports, 6, 20603 (2016). Abstract. Immanuel Bloch, Jean Dalibard, Wilhelm Zwerger, “Many-body physics with ultracold gases”, Review of Modern Physics, 80, 885 (2008). Abstract. Marco Anderlini, Patricia J. Lee, Benjamin L. Brown, Jennifer Sebby-Strabley, William D. Phillips, J. V. Porto, “Controlled exchange interaction between pairs of neutral atoms in an optical lattice”, Nature 448, 452 (2007). Abstract. Michael H. Kolodrubetz, Jason R. Petta, “Coherent holes in a semiconductor quantum dot”, Science 325, 42–43 (2009). Abstract. Frederico Martins, Filip K. Malinowski, Peter D. Nissen, Edwin Barnes, Saeed Fallahi, Geoffrey C. Gardner, Michael J. Manfra, Charles M. Marcus, Ferdinand Kuemmeth, “Noise suppression using symmetric exchange gates in spin qubits”, Physical Review Letters, 116, 116801 (2016). Abstract. R. Barends, L. Lamata, J. Kelly, L. García-Álvarez, A. G. Fowler, A Megrant, E Jeffrey, T. C. White, D. Sank, J. Y. Mutus, B. Campbell, Yu Chen, Z. Chen, B. Chiaro, A. Dunsworth, I.-C. Hoi, C. Neill, P. J. J. O’Malley, C. Quintana, P. Roushan, A. Vainsencher, J. Wenner, E. Solano, John M. Martinis, “Digital quantum simulation of fermionic models with a superconducting circuit”, Nature Communications, 6, 7654 (2015). Abstract. Andrea Crespi, Linda Sansoni, Giuseppe Della Valle, Alessio Ciamei, Roberta Ramponi, Fabio Sciarrino, Paolo Mataloni, Stefano Longhi, Roberto Osellame, “Particle statistics affects quantum decay and Fano interference”, Physical Review Letters, 114, 090201 (2015). Abstract. Christian Reimer, Michael Kues, Piotr Roztocki, Benjamin Wetzel, Fabio Grazioso, Brent E. Little, Sai T. Chu, Tudor Johnston, Yaron Bromberg, Lucia Caspani, David J. Moss, Roberto Morandotti, “Generation of multiphoton entangled quantum states by means of integrated fre-quency combs”, Science 351, 1176 (2016). Abstract. Stefania Sciara, Rosario Lo Franco, Giuseppe Compagno, “Universality of Schmidt decomposition and particle identity”, Scientific Reports, 7, 44675 (2017). Abstract. B.P. Lanyon, T.J. Weinhold, N.K. Langford, J.L. O’Brien, K.J. Resch, A. Gilchrist, A.G. White, “Manipulating biphotonic qutrits”, Physical Review Letters, 100, 060504 (2008). Abstract. K. S. Kumar, A. Vepsalainen, S. Danilin, G.S. Paraoanu, “Stimulated Raman adiabatic passage in a three-level superconducting circuit”, Nature Communications, 7, 10628 (2016). Abstract. N. Killoran, M. Cramer, M. B. Plenio, “Extracting entanglement from identical particles”, Physical Review Letters, 112, 150501 (2014). Abstract.